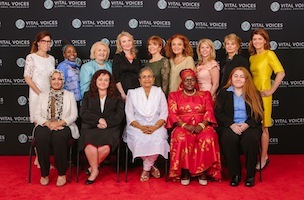 Tuesday night at the Kennedy Center, Vital Voices hosted its 13th annual Global Leadership Awards, in honor of women leaders from around the world working to strengthen democracy, increase economic opportunity, and protect human rights. The evening’s honorees included Priti Patkar of India with the Human Rights Award; Claudia Paz y Paz of Guatemala with the Leadership in Public Life Award; Suaad Allami of Iraq with the Fern Holland Award, in honor of Fern Holland, an American lawyer killed in Iraq; Dr. Victoria Kisyombe of Tanzania with the Economic Empowerment Award; and Razan Zaitounch of Syria, with the Global Trailblazer Award. 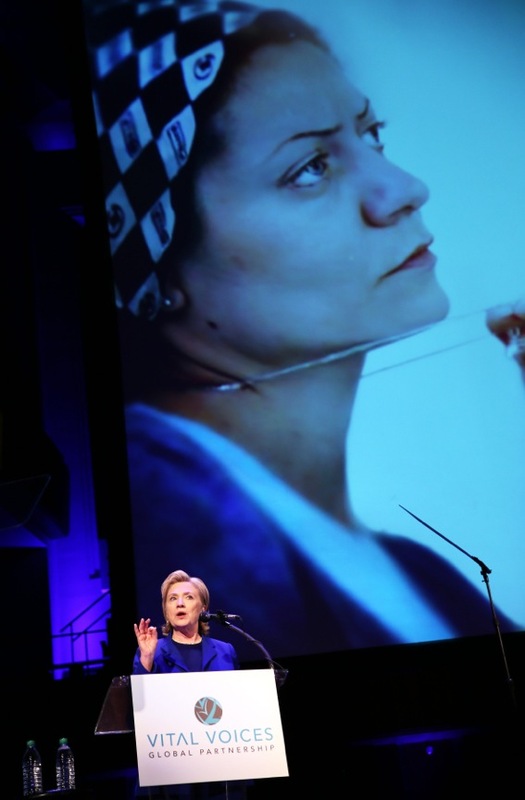 Zaitounch’s award was presented by former U.S. Secretary of State Hillary Clinton and accepted by Zaitounch’s sister, as the award recipient was kidnapped in Syria during December 2013 along with her husband and two colleagues. On Friday night at GW’s Lisner Auditorium, Clinton spoke with her former speechwriter Lissa Muscatine, co-owner of Politics & Prose, on the Hard Choices of her career as Secretary of State. The Vital Voices Democracy Initiative was established in 1997 by then-First Lady and former Secretary of State Madeleine Albright after the United Nations Fourth World Conference on Women in Beijing to promote the advancement of women as a U.S. foreign policy goal.